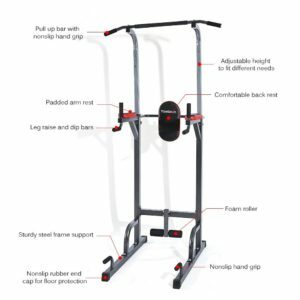 Tomshoo Multi-Station Power Tower is an adjustable, multifunctional, sturdy- durable and versatile exercise unit that can be used for knee raises, push ups, pull ups, dips, sit-ups for muscle strengthening and toning purposes- weight resistance of your lower and upper body- backs, arms, triceps, biceps etc. and core section- abdominals. It feels comfortable to exercise on with the densely padded arm rests and the comfy enough backrest that can be placed backward or forward depending on your needs, and the push-up bar has anti-slip handles so you can feel safer. 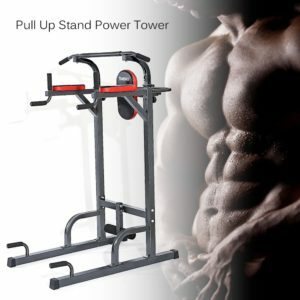 The pull-up and chin-up station offers multi-grip positions, and you can use the leg raise station to work on your lower core section and leg quad muscles and the dip station for triceps. It has a durable steel frame and solid construction that will help it last a long time and the maximum user weight capacity is specified as 440 pounds (200kg). The whole thing weighs 48 pounds (package weight is 53 lbs), measures 45.3 x 26 x 59.1-90.6 inches as you can adjust the height between 59.1 inches and 90.6 inches. It is designed for home gym use by one or two people on a daily basis, rather than in a commercial gym setting. The rubber end caps are anti-slip so the station will stay put during your workout and your floors will not be damaged by pointed corners. This is not the kind of multi-station power tower that you can do a total body workout including bench press etc. as it doesn’t have a built-in bench and pulley system and resistance bands like in some more expensive models but is priced accordingly, this is a budget priced model that seems to be quite good value for money. Like any fitness equipment you purchase online or at the store it is not sent assembled and you will need to do put it together with the instructions and simple tools in the package. It is nice to have the height adjustment, to accommodate shorter or taller people, or lower and higher ceilings. It has a small footprint and doesn’t take up much space if you live in a smaller place with not much space to allocate for a home gym and the weight capacity is 200 pounds and if you’re heavier it will start wobbling a little. For the very low price point concerned, you’re getting quite a bit for your money: Multifunctional, flexible, durable with a heavy-duty build and ergonomic design for your comfort and safety. It is perfect for those that don’t have a lot of time or money to get to the gym regularly.